After suffering a knee injury during Hawick RFC’s 2017-18 season opener that sidelined him for 10 weeks, Darcy Graham is now ready to reintroduce himself to the rugby world and show everyone what he is capable of, again. Graham’s road back to his rugby life began with that all-too-familiar sight on sports fields across the world: player lying on the grass, clutching his or her body, surrounded by medical personnel, the crowd hushed in silent prayer, hoping everything will be OK.
That was early September in the waning minutes of Hawick’s opening-day defeat to the Currie Chieftains. Graham was advancing with the ball in hand up the right-hand touchline, typically trying to spark something out of nothing. But as the star winger braced for impact from two tracking Chieftain defenders, he planted his left leg awkwardly, his foot getting stuck in the Mansfield Park turf, and one of the tacklers hitting his exposed knee flush with a hard shoulder. Staring upward into the early evening sky, reaching his left hand towards his knee, in pain before he even hit the ground, Graham knew what had happened. He knew the injury well, having experienced something similar playing sevens as a 13-year-old, and he knew he wouldn’t be playing rugby any time soon. “As soon as I was hit, I knew I had injured my knee and I was done for a while,” admitted Graham. Graham was part-winger, part-gamechanger for the Robbie Dyes last season. The recently-signed Edinburgh rugby professional was the Greens coaches player of the year and Green Room, voted by club members, player of the year last season. 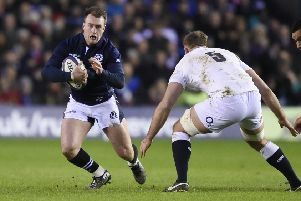 His starring performances for the Scotland Under-20s side in the RBS Six Nations and Under-20 World Cup helped seal a move into professional rugby and his future as one of Scottish rugby’s hottest prospects. Ahead off the 2017-18 season, Graham had started for new side Edinburgh during their pre-season campaign against Aviva Premiership giants, Sale and Newcastle. New Scotland national team boss Gregor Townsend even included the winger in a two-day senior Scotland international training camp in August. Picked No.1 by Hawick in the professional player draft for the upcoming Premiership club season, Graham was finally ready to begin the next chapter of his rugby career. That was until the 78th minute against the Chieftains. “To happen in the first game of the season, playing for Hawick, was not easy to take, it was very frustrating,” continued Graham. That unlucky injury pushed pause on Graham’s first season as a fully-fledged professional. The winger had admitted he hoped to be pushing for a place in Edinburgh’s Guinness Pro 14 squad by the autumn international break, while also helping Hawick rebound from a dismal 2016-17 Premiership campaign .The injury changed his short-term plan but, throughout the rehabilitation program, designed by Edinburgh, never once did the 20-year-old waver or doubt those goals were lost. They would just take a bit longer to achieve. After scans revealed no structural damage, just an MCL strain, Graham thrust himself into his rehab and now, 10 weeks after clutching his knee on the Mansfield Park turf, is ready to start again. “At the beginning of the year, I had always sort of put a goal of pushing for a place in Edinburgh’s Pro 14 squad by the Autumn internationals. It was something that I felt was really achievable,” added Graham. “I had said to myself I wanted to be involved with the squad when they went to South Africa. The injury obviously put a stop to that but right after the scans revealed no major damage, I got to work rehabbing and smashed it. I took a step back a bit during the injury and thought maybe suffering it was a bit of a godsend, as odd as that sounds. It gave me a chance to build up my muscle and really prepare my body for the rigours of professional rugby. “I have struggled to put on weight over the years but, during this, I managed to put on some muscle. I was working with (former Edinburgh and Scotland international backrower) Roddy Grant in the gym and all the physios and strength and conditioning coaches. “They helped a lot and now, 10 weeks on, I am fully ready to go, 100 per cent. I actually felt by rehab week seven or eight that I was ready to go but the coaches kept me to a strict schedule, as they have dealt with these sorts of injuries for years. “Ironically, I was given the green light to play a couple of weeks ago and was selected to play for Hawick against Currie, but I fell ill with the flu that whole week and had to withdraw. Graham’s injury would ignite a number of different emotions in most people’s minds. Would I return as the player I was? Would my team forget about me? Would I become just another statistic of a player who was too injured to fulfil their talent? And would I be the same? Graham never questioned himself. He always knew he would be back and this time he believes he is better than ever.